Some of our recent purchases of interesting individual libraries or collections of second-hand books are listed below. Click on the title of the collection to display all titles within that collection. Pamela Gilbert (1932–2015) was the head of the Entomology Library and latterly Deputy Head of Library Services, at Natural History Museum, London. During her long and fruitful career at the Museum (1951–1992) she had gained a reputation as an ‘entomologists’ librarian’, the ‘doyenne of Lepidoptera librarians’. She also made important contributions to the History of Entomology, helping produce a series of invaluable reference works in the field. Her best known publication is the self-described ‘necrology of entomology’ - 'A Compendium of the Biographical Literature on Deceased Entomologists' (1978) and its companion volume 'A Source Book for Biographical Literature on Entomologists' (2007). Pam also took a great interest in manuscript, artwork and other historical material and produced works such as 'Butterfly Collectors and Painters. Four centuries of colour plates from The Library Collections of the Natural History Museum London' (2000), and 'John Abbot: Birds, Butterflies and Other Wonders' (1998). She also co-authored 'A Catalogue of Manuscripts in the Entomology Library of the Natural History Museum, London' (1996) and contributed to many other works. Many of the books in the collection are association and presentation copies inscribed to her by publishers, authors and illustrators. T.G. HOWARTH (1914-2015) was a British entomologist at the Natural History Museum in London. During the Second World War he enlisted in the Royal Medical Corps, and in 1941 was posted to Singapore with the mission of finding and destroying the breeding grounds of malaria-carrying mosquitoes. Partly through his efforts, Singapore became malaria free, but in 1942 when the British army surrendered to the Japanese, Howarth was taken prisoner. He spent three years as a Japanese prisoner of war, first in the notorious Changi jail in Singapore and later, in a forced labour camp in Jinsen, Korea. Howarth survived the insidious ‘war against boredom, starvation pestilence, and death’ by engaging in ‘prison camp entomology’. During his internment he discovered new species, collected 1,115 butterflies, 347 moths and many other insects. After the war, Howarth started building strong ties with the Japanese lepidopterist community. He became an authority on Japanese butterflies, and the Japanese in their turn honored him with life membership of their Lepidopterological Society, as well as naming a new genus of hairstreak butterfly - Howarthia - after him. Howarth’s life-long interest in Japanese butterflies is reflected in the present collection featuring Japanese books, mainly signed presentation copies, as well as correspondence with Japanese colleagues. He used books as repositories for his correspondence with authors, colleagues, researchers and publishers, and this material – manuscript and typed letters, photos, telegrams, and various ephemera - is offered together with the books in which they were ‘filed’. Especially noteworthy is the enduring correspondence with Suguru Igarashi, friend, colleague and chairman of the editorial committee of the Lepidopterological Society of Japan. Paul Sokoloff was an esteemed amateur lepidopterist and bibliophile, whose collection of fine and rare books was renowned amongst his fellow entomologists. He was active in the British Entomological and Natural History Society, serving as its president in 1984. 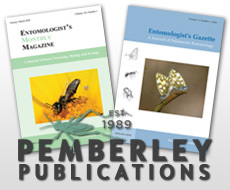 He was a regular contributor to the journal, 'Entomologist's Record', and served as editor of this journal from 1985 to 1995. Gerry Tremewan (1931-2016) was a famous Cornish entomologist who worked on Lepidoptera from the age of 12 until his death aged 85, specialising for over 60 years on the Zygaenidae. He was also editor of the 'Entomologist's Gazette' for 52 years.